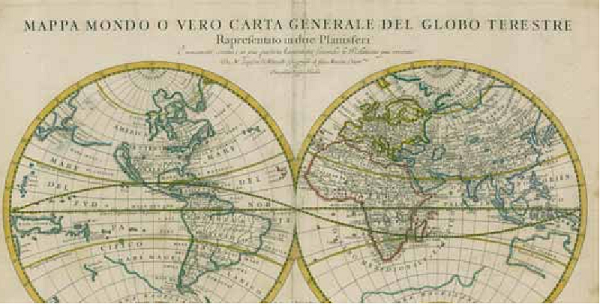 Global map courtesy of Yale University Library. A small working conference, International & Area Studies Collections in 21st Century Libraries, was held November 2–3, 2012, at Yale University, sponsored by the Duke, Columbia, and Yale University Libraries. Academic library leaders responsible for international and area studies collections and staff gathered to discuss common challenges and identify strategic areas for joint action. The conference represented the first time U.S. research library managers with oversight for these collections have met to create an ongoing forum for exchange. The idea for a conference emerged as a result of the growing number of librarians with director-level responsibility for international and area studies collections. The conference conveners—Kristina Troost (Duke University Library), Pamela Graham (Columbia University Library), and Ellen Hammond (Yale University Library)—found they faced similar issues and challenges within their respective departments, but had few opportunities to discuss issues of common concern with other colleagues in research libraries across the U.S. who direct or supervise international/global/area collections. Discussion at the event reflected a sense of urgency about the need to better position these library units so they can continue to thrive in rapidly changing academic library organizations. The participants recognized that improving their ability to advocate for their units while effectively demonstrating their organizational impact is a key challenge going forward. repository for job descriptions, shared data, etc. Third, there was agreement on the need to focus on the recruitment, training and mentorship of area studies librarians.